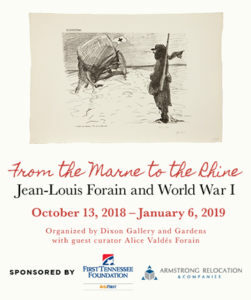 Until January 6, 2019 , The Dixon Gallery and Gardens, Memphis, Tennessee, celebrates the 100th anniversary of Armistice Day with a selection of Jean-Louis Forain’s striking press illustrations of the Great War. From the Marne to the Rhine: Forain in World War I, showcasing prints gifted by John and Lynn Murray in honor of William and Mary Murray, delves into the events of a war that changed the world. At the turn of the century, Jean-Louis Forain (1852-1931) was already a celebrated painter and satirical draughtsman renowned for his sharp insight into contemporary Parisian habits. As a press illustrator, Forain closely followed the evolution of the international political scene and the rising tensions between France and Germany. With more than 200 war cartoons published in weekly and daily newspapers, Forain became the spokesman for the common soldier on the western Front, the main theatre of war approximately located between the Marne and the Rhine rivers. His description of war realities depicted the great battles and life in the trenches. This brought conciseness and irony to bear on political, military, economic and social issues with many of his drawings directly relating to the army fighting in Europe and the engagement of the United States in the conflict. “You have to let the paper breathe”, Forain once affirmed. He emphasized one element or another by sketching against an uncluttered background in order to make his message very clear. Confident in his talent for capturing movement and volume, his line became increasingly simple. His vigour and swiftness of execution, the depth of his blacks and the luminosity of his whites made him the most famous caricaturist of his time. Forain did not deform or distort figures or facial expressions to make his characters grotesque as he quickly perceived that one does not win a war solely on the battlefields. France was facing an enemy not ready to be defeated, therefore, the draughtsman committed to maintaining the spirit and patriotism of his contemporaries. Showing the drama underneath the comedy, the drawings give with emotion, irony, pity, sorrow, indignation and compassion, a priceless testimony of how military and political events affect populations. From the Marne to the Rhine: Forain in World War I encapsulates the artist’s unique style and incredible science of composition, which undoubtedly contributed to the evolution of the art of the editorial cartoon. Organised by The Dixon Gallery and Gardens with guest curator Alice Valdes-Forain.